The logical first runner-up is, of course, British Petroleum. It doesn't take a brain surgeon to realize that BP was cutting some major corners on safety and costs and will no doubt argue to their shareholders that they were operating in their best interests. Next is the regulators of these operations. Was there no oversight, no inspections, nobody manning the whole shebang? Is our government equally ineffective at keeping us safe from oil spills as it is at preventing food borne illness outbreaks and protecting us from hazardous chemicals in our products? Finally, let's not forget the consumers of oil. Yes, folks, that's me and you. Anyone who has a hand in demanding cheap fuel should certainly share some of the blame. I'm not about to suggest that all the above are not party to this horrible disaster. This is a message to extreme "environmentalists" who hypocritically protest domestic energy production offshore and onshore. There is nothing “clean and green” about your efforts. Look, here’s the deal: when you lock up our land, you outsource jobs and opportunity away from America and into foreign countries that are making us beholden to them. Some of these countries don’t like America. Some of these countries don’t care for planet earth like we do – as evidenced by our stricter environmental standards. Radical environmentalists: you are damaging the planet with your efforts to lock up safer drilling areas. There’s nothing clean and green about your misguided, nonsensical radicalism, and Americans are on to you as we question your true motives. True motives? Methinks you are projecting. There are so many logical fallacies and mental acts of legerdemain in her whole note (the above is just a clip) that it's astounding. What's even more shocking is the sheer number of her followers (or "fans" on Facebook) that wholeheartedly agree with her. Over 8,000 last time I checked. Are environmentalists truly to blame here? Discuss. I blame Sarah Palin and her "drill baby drill" minions. If she spent half as much energy talking about solutions for our energy gluttony as she does blaming enviormentalists energy problem would be solved. Other than that I blame... Us. If it was'nt for our gluttoness need to get from point A to point B all the time we would be in a much better position than we find ourselves in. Oh. my. god. Is this even possible ? It's pure nonsense ! This kind of things just make my jaw drop and my brain go blank, what could one do to go against so much stupidity and hypocrisy ? Ms. Palin may be incoherent with her position, but she isn't the first to make this statement. I do believe that BP and other companies are out there deep water drilling solely because leases for shallow and land locations have been taxed, and played with by the government, and encumbered by various activists. And I do believe that the historical activist community behaves more like ACORN and organized labor unions, obstructing for the sake of obstruction, for media time, and for name recognition, rather than trying to actually make something better. I encountered several groups proud of shutting down much of the Premarin/PMU industry, running their campaign on the basis of poor handling of the horses involved - among a few providers, reported a decade ago or more, and cleaned up by the industry. Yet you see those same organizations still campaigning with those same reports and images from that single initial, remedied report. A lot of horses have been killed because of this, and a lot of women risked their health stopping hormone replacement therapy because of the activists. Are there better replacements for Premarin today? There are synthetic replacements, some with different side effects than Premarin, and different risks - and that some women tolerate better than Premarin. Overall, though, the activists involved - gained name recognition and funding. So, yes, the argument that BP was in deep water today because activists interfered with less-expensive places to drill is credible. Just look at the games Obama and company are playing with leases this current week - issuing permits, canceling them, requiring new safety regulations, and halting shallow water drilling until they get around to writing new regs. That is *not* the way to go about disproving the claim that the US and activists are playing games with oil exploration. Let alone how Obama cut the Florida (Republican) Attorney General out of a meeting of Gulf Attorneys General. 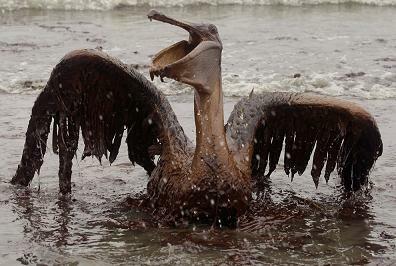 Politics, they are playing politics and image control, not mitigating an oil spill. Oh, and while we worry about oil washing up on the Atlantic side of the US - what about when the Gulf Stream meanders it's way to Europe in another 40 or 50 years. Won't that be an interesting experience in changed water chemistry? We're all to blame - at least anyone who uses gas to fuel any sort of vehicle, oil to heat their homes or any other product that is a petroleum derivative. As long as consumers demand cheap oil then this sort of thing will happen. Maybe not as horrible as this but wherever humans are involved in an endeavour then accidents will happen. We are unwilling to pay the true cost of oil. My cousins in England pay what we would consider an exorbitant price for oil and you rarely, if ever, see the huge gas guzzlers that prevail on the North American roads, nor the huge houses that cost a fortune to heat. There are cleaner technologies but the will to develop them seems to be lacking in the general population. We are too addicted to a cheap and plentiful supply of oil. I'm gonna stick with blaming BP, and specifically those who were running the show the day the platform exploded. From what I've read they had signs many hours beforehand that something was wrong, but instead of shutting down what they were doing and making things safe, they continued on. They're the ones who have direct responsibility. I would also like to know exactly where Ms Palin thinks we should have been drilling that would have been so all-fired safe. The craziest thing about Sarah Palin's comment is this: oil companies drill where they find oil. BP isn't drilling out in the Gulf because environmentalists told them to -- they are drilling out there because they will extract oil, which they can sell to make increase their profits and make their shareholders rich! Anyone who thinks that BP would swear off deep water drilling for oil if they could drill closer in, or in ANWR, or in my backyard for that matter, is absolutely nuts. They are the fifth most profitable corporation in the world. They would love to drill in BOTH places at once. You are right though. We are all to blame. Me, with my iPads and 11 minute commute to work, and failure to turn off the lights every time I leave the room. Maybe I'm not as much to blame as BP, but dang it, we've had 20 years to figure out how to use less power or how to generate clean power (since the Exxon Valdez spill) and I've failed miserably in my duty to try. Where can I find information about alternative energy sources for my house? Given that I live in Portland, I don't think solar is really an option. Steve Schmidt, chief strategist of John McCain's presidential campaign, on a 60 Minutes interview: "A week later, after the convention was over, she still didn't really understand why there was a North Korea and a South Korea. She was still regularly saying that Saddam Hussein had been behind 9/11. And, literally, the next day her son was about to ship off to Iraq. And when they asked her who her son was going to fight, she couldn't explain that." I think she's pretty much an air-head with a perky smile.I can't understand why anyone gives weight to anything that comes out of her mouth. I think there is plenty of blame to go around. I know that I have become increasingly conscious of my fuel use since this happened. At the end of the day, though, this accident happened because BP was cutting corners on safety according to company documents and "monitoring" reports. My father worked in the oil field for 25 years. He worked on off-shore wells in the Caribbean almost 30 years ago. He explained to me that the safety procedures on their rigs involved a triple redundancy before BP became involved in their operations. Their standard operating procedure was to test the blow-out-preventer for five minutes full pressure. After BP became involved, the game changed completely. In the current situation, I believe I read that BP was testing the b-o-p for 30 seconds at far less than operating pressure. Anecdotal, I know, but interesting nonetheless. Before we go blaming environmentalists though, I think it is important to remember that this same accident could have happened much closer to shore and in shallower water. The accident did not happen because of the location of the well. I will grant, however, that it would probably have been easier to cap the well in shallower water, but it would have been more difficult to try to contain the spill before it hit the shores. I can't understand how, when drilling at such depths, BP had no contingency plans for a worst-case scenario. It seems like common sense to me. The whole "Hope for the best, but plan for the worst." I'm sure that more details and blame will become available in the coming months. Still, let's all drive a little less and push our communities to step up with better public transportation. There is also a documentary about Mike Reynolds called "Garbage Warrior" that was made in 2007 if you can get it. The guy has a lot of really interesting ideas for creating self sufficient houses and communities that are made from renewable and green technologies. It's a good starting point. There are also solar panels made these days that require very little sunlight to provide energy. I live in a northern clime where we don't get a lot of sunlight and yet many people use solar panels for some, if not most, of their energy needs. There are also appliances that require very little energy to run although the initial investment is higher. A cleaner, greener future is possible if we have the will to create it. The trouble is that it requires some financial outlay and a shift in lifestyle and that discourages a lot of people. I like to think of it as being a pioneer, however, and pioneers have to be willing to make sacrifices. And to those who just want to blame BP alone: as long as we can continue pointing the finger at someone else and blaming all our woes on them, then things will never change. As Gandhi said, "You have to be the change that you want to see in the world." Ugh. I have a hard time reading or hearing anything from Palin or Limbaugh (or Glenn Beck) without going completely MAD with frustration. If it wasn't for us "extreme environmentalists," NOBODY would be looking at alternate sources of fuel. We'd just be going on our merry way - until the oil/coal ran out, and in the process, completely polluted the Earth. Fortunately, there ARE people in this world that think of the environmental consequences of our actions. And have the vision to think of different solutions. The norm that we fantasize about returning to is when we imagine that we control our circumstances by pumping the substance through pipes to containers to refineries to gas stations to automobiles to exhaust pipes to a warming atmosphere (or, to fertilizer factories to farm machinery to topsoil to erosion to rivers and back to dead zones of the Gulf). In other words, our experience and belief in “control” is little different in the end than our current felt condition of “helplessness.” The only real difference at the moment is the concentrated visibility of the disaster, one that makes visible what is usually hidden – that our civilization exists by poisoning our world, by a concerted and organized effort to release toxic substances from confines where they are relatively sequestered for life to flourish, to a condition where we must come to mistrust the food that we eat, the air that we breath, the water that we drink. As for who to blame, everyone is. Unless we belong to some tribe that lives in a remote village up in the Himalayas or in Central Africa (in which case we have no idea what you're talking about), we all are responsible for this disaster. Blaming BP or Halliburton or the President or whoever puts the locus of control on someone else besides ourselves. Most of us in the U.S. make daily choices on how to live. Even if we live off the grid, the grid is responsible for us being able to live completely off of it. Guilt is not a way for long term change. A true analysis of our lifestyle and consumption habits and desires and wants is only how change is possible. maybe some more incentive to change our gluttonous ways of consumption would be to read the article in the most recent Mother Jones magazine called "The Last Taboo". I challenge anyone to read it and feel good about being an American. This whole situation has me heartbroken. So, what am I going to do about it? I've been looking into B99.9 and getting an old diesel van. I'm still researching now but I would love to hear any thoughts you all have. Sarah Palin's comments are so off that I won't even comment. I could cry when I think of all the damage and destruction and of all the animals who suffer so much and die such a greaceless and horrible death. And then to read was Palin has got to say to that...I despise her style. Her rethoric is all about blaming everybody else in a hateful way, creating hate and persecution. Makes me sick. And I agree with you: BP and the gov are to blame first, but then there'd be no need for drilling, or the incentive to look the other way wouldn't be as big if people would finally stop needing that much oil. Americans are top in oil consumption, but Europe has to wake up too and change things. The picture of the pelikan(?) makes me cry. BP is to blame, and I say that as a pensioned person (along with my husband) from this very company. Actually, they bought what once was Amoco Oil or Standard Oil, but they've honored the pensions we left with. Even when BP was Amoco or Standard, they took shortcuts when it came to saving money or environmentalism. I saw ONE man (with a family) leave the company because he didn't think his ethics were compatible with those of the company. The rest of us were very pleased working for them. They paid well, had interesting work (hub and I were both mainframe computer programmers) in non-sweatshop conditions. Hub still owns considerable stock in the company, so I hate to see its value shrink over this, but it's been paying our house taxes for a long time now, so maybe it's time. We're far enough from the gulf to not be threatened, yet close enough to "feel the pain" of the losses of industries there. On Sarah Palin, I consider her nuts, so don't pay any more attention to her than I did the folks on soap-boxes in London's Hyde Park. Same for Glenn Beck. Sure, they have some followers; so did Jim Jones. "A week later, after the convention was over, she still didn't really understand why there was a North Korea and a South Korea. She was still regularly saying that Saddam Hussein had been behind 9/11. And, literally, the next day her son was about to ship off to Iraq. And when they asked her who her son was going to fight, she couldn't explain that." actually, 8,000 followers seems like a really low number to me; given the noise she generates. I find that encouraging! Elizabeth B - :-) I feel your pain! Try looking at the Palin Syndrome as an educational opportunity. Really. We are taught, and love to believe, that we are rational beings, who make good rational decisions, based on facts. There truly is no evidence for those beliefs. Really. Not joking. Realizing that can be liberating. In a very painful way. I just heard a brief story on NPR about how people are not seeing the connection between the cars they drive and the oil spill. They're all mad about the spill but what they're really scared of is gas prices rising. Nope, nobody's considering changing their habits. I don't know if any specific person or company or agency is to blame for the accident itself or for that fact that we are so dependent on oil. (I just went through a 2 1/2 day blackout and I can't tell you how much I appreciate electricity!) I do believe that this situation is a perfect storm of people, companies, and agencies that have made the spill situation worse. It really pains me to agree with those who point to the EPA (whom I do not see as extreme enviros) who blocked some of the early efforts to disperse the oil via chemicals, burns, and building barrier islands because they were afraid they would harm the environment. True, they would, and I don't want that either. However the oil still gushing out of the ground is also harming the environment. It's like telling someone they have fix the broken windows on a burning house before they can put out the fire. I'm also very disappointed that this area has not been declared a Natural Disaster. Doing so wouldn't keep BP from covering the costs they should or from shouldering the blame they should. However it would allow local people to apply for aid since their fishing businesses are ruined. It would allow more federal agencies like the Army Corps of Engineers, who I believe are better trained at dealing and fixing things like this on the fly than a bunch of suits. Beany & Azulao said it best. It's me and you and our lifestyles that call for cheap oil. Yes, I think it's true that we're all to blame. I can remember a friend of mine basically tell me that she's not going to "go green" just because other people are, and that she doesn't want the government telling her that she has to, either. It just made me think that a lot of people out there, like her, are simply going to oppose environmentally friendly ways of doing things because they are inconvenient. And that's tragically sad. I think, honestly, that the situation in the gulf is not just about consumerism, but about greed of big companies and their desire to have a large amount of oil reserved, but we all know that they will only allow so much oil on the market, so why do they need to keep drilling for more? I think that the only way to prevent environmental catastrophes like this one is to stop ALL new drilling, especially in places like the ocean and Alaska, and to pass legislation that will FORCE automakers to build better and more reliable low-fuel or electric cars, and engine replacements for older cars that they can run on less fuel or electricity as well. Those are just a couple things that can be done, and I know they're not perfect ideas, but there are a lot of people in this country and the world, I'm sure that we can come up with a few ideas to lessen our dependence on crude. Aside from the obvious, like not buying so much crap and being more considerate about what materials we DO buy in the first place.